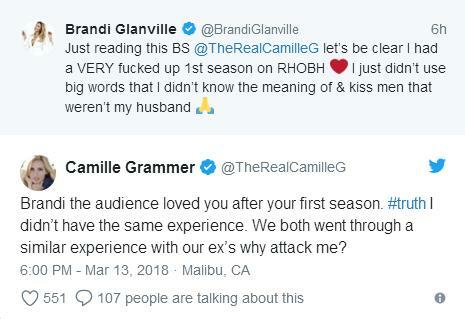 iRealHousewives | The 411 On American + International Real Housewives: Brandi Glanville Slams Camille Grammer In Twitter Feud Over RHOBH! Brandi Glanville Slams Camille Grammer In Twitter Feud Over RHOBH! Brandi Glanville is responding Camille Grammer's tweet after The Real Housewives of Beverly Hills star told fans of the series that she thinks Dorit Kemsley and Glanville were “spared” by production in the past. 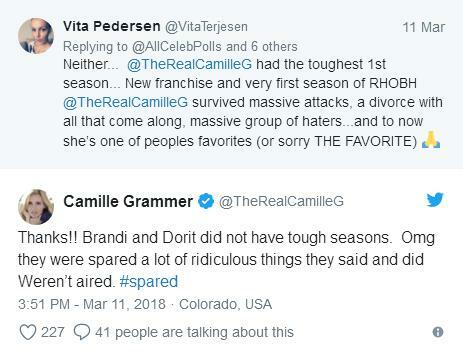 "Just reading this BS @The RealCamilleG let's be clear I had a VERY fucked up 1st season on RHOBH," she wrote, adding a heart emoji. "I just didn't use big words that I didn't know the meaning of & kiss men that weren't my husband. 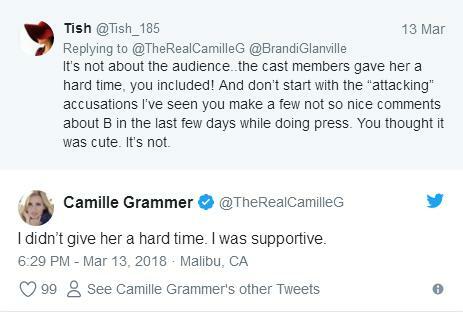 While Brandi threw major shade towards Camille's way, Grammer explained and defended her tweet by saying," Brandi the audiance loved you after your first season. #truth I didn't have the same experience. We both went through a similar experience with our ex's why attack me?" 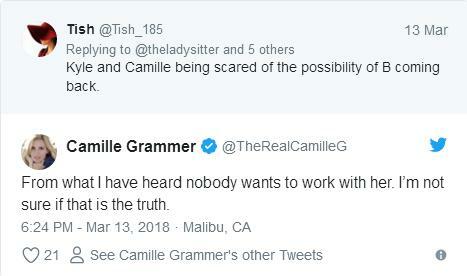 After a viewer accused Camille and Kyle of being scared of Glanville's potential RHOBH return, she replied:, "From what I have heard nobody wants to work with her. I'm not sure if that is the truth." Meanwhile, Camille defends her original tweet and makes it clear that she was "supportive" of Glanville's first season of RHOBH. "I didn't give her a hard time. I was supportive," she tweeted. Brandi ended the Twitter feud by saying the following: "I like you @TheRealCamilleG and I always have your back as you know through lawsuits and all but do you remember my crutches being hid ???" Brandi is referring to Season 2's Game night when Kim Richards hid Brandi's crutches as she was facing off with the Richards sisters at Dana Wilkey's house. This feud erupted after Camille said that Dorit and Brandi were both "spared" by RHOBH producers in the past, which resulted in her getting into a fight with Kemsley earlier this week via Twitter. If you recall, Andy Cohen infamously revealed a magazine cover that called Camille “America’s Most Hated Housewife” after season 1 aired 2010 to 2011. Brandi, meanwhile, was known for making controversial comments on the series, reports Us Weekly. “You were spared some of the comments you made at The Project Angel Food event. 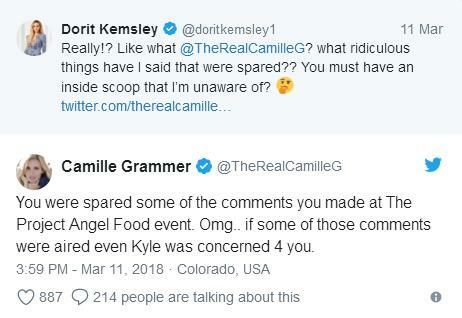 Omg.. if some of those comments were aired even Kyle was concerned 4 you,” Camille tweeted back. 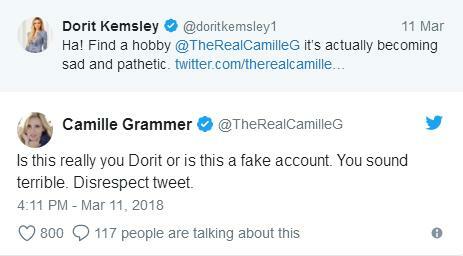 Dorit did not take Camille’s comments seriously. “Ha! Find a hobby @TheRealCamilleG it’s actually becoming sad and pathetic,” she tweeted. “Is this really you Dorit or is this a fake account. You sound terrible. 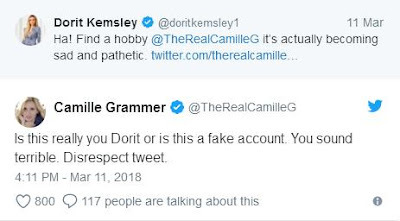 Disrespect tweet,” she tweeted, later clarifying she meant “disrespectful tweet,” Camille fired back. Who's side are you on? Brandi or Camille? Sound off in the comments below!